Did You Serve? As a Veteran, you are eligible for many benefits earned through your service, among them are the advantages of the VA Home Loan program. It’s my privilege to educate you on these homebuying benefits and to help make those benefits accessible and attainable for you to purchase homes in North Phoenix and other surrounding cities and communities in Phoenix. Home buying Benefits for Veterans to Purchase Phoenix Homes. For many, the biggest obstacle to buying a Phoenix home is saving up for the costly down payment. With the VA Loan, homebuyers are not required to put any money down. The rigors of military service can often do a number on a person’s credit report. More than 80 percent of Veterans and service members using a VA Loan wouldn’t qualify for conventional financing, but the flexible qualification standards of the VA Home Loan program gives those who have served a path in which to purchase a Phoenix home. As a Certified Veteran Homebuying Agent we have the knowledge and expertise to assist you through the VA Home Loan process. From our first conversation regarding your wants and needs in a home. we’ll be by your side to guide you through the purchase contract process all the way to handing you the keys to your new home. Contact Us today to see how we can assist you as a Did You Serve? 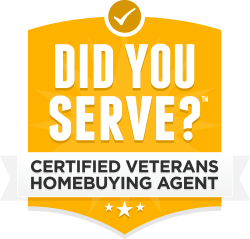 Certified Veteran Homebuying Agent it can make the difference in your homebuying experience.